Sometimes there just seems to be nothing inspiring around. These are the times to challenge yourself. 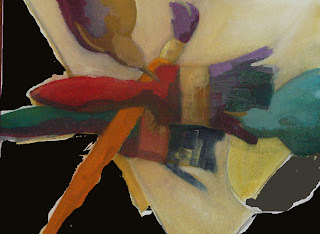 My bird series began as a benign bird painting in 1994 and it has now grown into an ongoing series of bird paintings. The evolution has been one that is continual but somehow not complete. I tend to find the shape and symbolic meanings of birds so intriguing that even today I can still find ways to sneak one or more into a painting. Birds have become my “muse”. Webster’s II Dictionary defines the word muse- as to think about at length ;or a source of inspiration. I do believe both definitions come to mind when I paint bird shapes. There are many ways to look at your subjects. What happens when there is no still life to paint, no model available, no photos that give you the urge to paint? I recommend looking around your studio and finding the objects that are familiar to you and using them as your subject. On this particular day of painting it was my brushes. Brushes in and of themselves are not that interesting, so the challenge was to paint the brushes and make them unique. 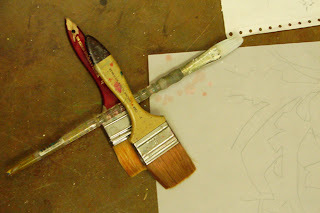 Below there is a photo of how I began to design the layout with my brushes. You will notice I did this on my floor in my studio, probably not an orthodox method but if it works, go with the flow. The second step after finding a design you like and that you believe is a good design, drawing it on paper or canvas. I used paper,watercolor and gouache for this painting. Step two illustrates the first coat of paint. I like to layer paint and I usually but not always begin with a yellow hue in watercolor as my first layer. Yellow is a good pigment to use as the first layer because it will blend or layer well under other pigments. This sets the stage for the rest of the painting. 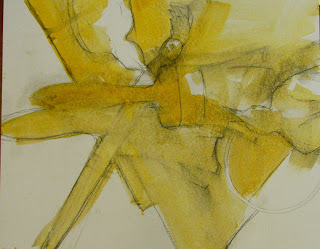 The yellow pigment will give harmony by being the underpainting for the layers that are to come. Have you noticed yet? I put birds in my design, this distinguishes these as my brushes by using the familiar bird shapes, and it gives the piece a bit of intrigue. One might wonder about why the birds are there and what they are doing etc. Now for the design, I don’t paint the two bird shapes the same but actually I use somewhat complementary hues on them. I have at this point done probably 7 layers on each bird with more to come. I use the same technique and thought when painting the brushes. Now I will have to deal with the shape around the edges of the piece. 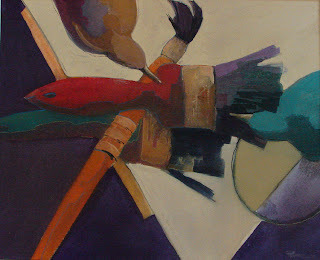 I am thinking of something in a much deeper value to “pop” the layers of color on my birds and brushes. I take a digital photo of the painting at this stage and open it in photoshop to test out my idea before I commit it to the actual painting. The photoshop step will save you a lot of valuable time and paper. I am convinced the deeper value will definitely improve the painting. I will go forward with the plan. Here is the final painting,”Brush Pile”. I went with the deeper value but I kept the color choice in the range of the rest of the painting. 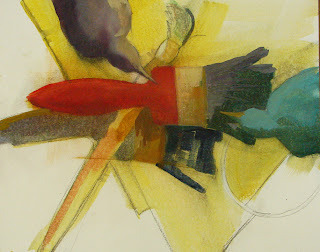 The deeper value was achieved by layering the hues found in the birds, brushes, and the brush bristles. I chose to use the same colors rather than a stark black to give the painting harmony. I hope this will inspire you to paint some familiar objects the next time you are out of subject matter to paint. All artwork and text posted on this blog are solely owned and copyrighted by Cathy Hegman and should not be reproduced or copied in any form or fashion without the expressed written permission of Cathy Hegman. Anything included in this blog is solely the personal experience and thoughts of the artist and not meant to be anything more than helpful guidelines for others to read. >I know what you mean about the lack of inspiration. I do the same thing with my camera, shoot stuff around the house until I find something that works.